Damages for a Breach of Contract? For any company, a contract is the first and strongest line of defense against a partner, vendor or customer who may not hold up their end of the deal. In any breach of contract case, it is not simply a matter of broken promises—the offended party may have suffered significant loss of earnings, profits and potential for future growth. 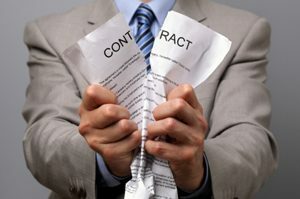 If you find yourself facing a contract dispute, you may be wondering what kind of damages you could expect to recover from the company that breached the agreement. With over 25 years of contract law experience, Los Angeles business litigation attorney Robert G. Klein can help you find the best possible remedy for your breach of contract case, up to and including compensation for the financial damages your business suffered. Through legal action under California contract law, you may able to win damages for the totality of your losses, whether they have already occurred or would be avoided had the contract been fulfilled by all parties. Specific performance, which essentially forces the other party to hold up their end of the deal. In certain cases, this may be preferable to monetary damages. No matter what your situation is, having qualified and experienced Los Angeles contract disputes lawyers can ensure that your business receives what it rightly deserves. If your business is suffering due to a breach of contract, you can get assistance when you contact our business lawyer. It is unacceptable to suffer lost profits and damaged revenue potential simply due to someone not holding up their end of a deal. With over 25 years of California contract law experience, business attorney Robert G. Klein has the skills that your business needs to pursue damages from the offending party.